Next Club Night – Wed 27th June – Anthony John Clarke. The guest at Irvine Folk Club on Wednesday 27th June is the internationally acclaimed singer and songwriter Anthony John Clarke. Whilst he has played at the Club on several occasions, for anyone who has not heard Anthony John, make sure you put the 27th June in your diary. The softly spoken, fast talking and very engaging Belfastborn Anthony John Clarke has been on the folk circuit for many years. He has played at hundreds of Clubs and Festivals across the UK, Europe, Australasia and USA. Anthony John has 12 CDs and two Songbooks to his name – Laughing at Clowns being his most recent CD. Anthony John lists Al Stewart, John Martyn, Joni Mitchell, David Bowie and John Prine amongst his favourite songwriters. Songs by Anthony John are Irish songs, storytelling songs, songs with an edge, songs of love, social comment and songs of everyday life. His songs will make you sit up, listen to the words and think about the unfolding story they tell. But don’t think it’s doom and gloom with hard-hitting messages in every song. Anthony John sees entertaining the audience as his first responsibility. And this he does so very, very well. Fans of Anthony John are many and loyal and the numerous tributes from his peers reflect his acknowledged talents and hard work…plus the fact that he is one of the nicest guys on the folk scene. Anthony John Clarke being the guest at Irvine Folk Club on 27th June puts that night in the ‘not-to-be-missed’ category. Make sure you are in the audience at Vineburgh Community Centre in Quarry Road to hear the man with the shiny red guitar – Anthony John Clarke. The Club starts at 8pm and it’s BYOB. 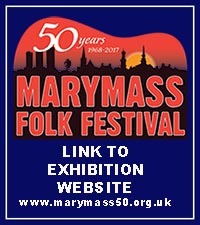 Finally, look out soon for information leaflets for the 45th Marymass Folk Festival – the dates of which are Wednesday 22nd – Sunday 26th August. A first class line-up of artists is in place – make sure you get a copy of the programme.